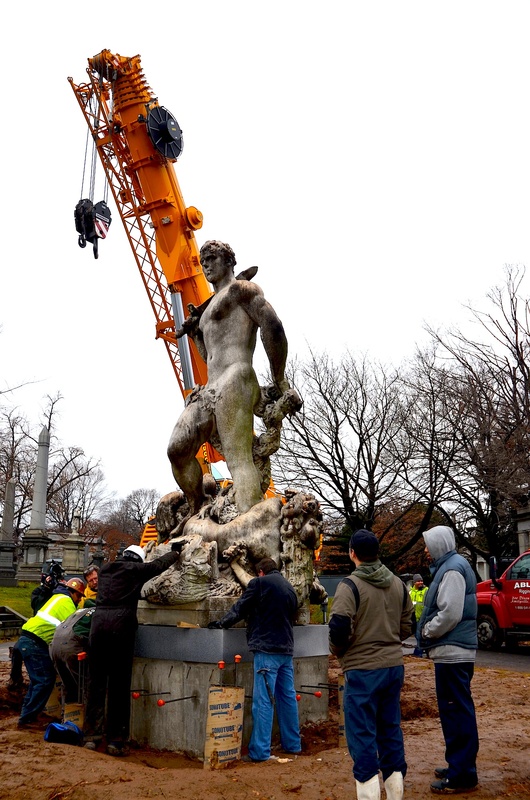 After much effort, and some controversy, Civic Virtue, Frederick MacMonnies’s sculpture from the 1920s, has arrived, and been installed, at Green-Wood. It was a long journey. Civic Virtue was carved in marble in the Bronx. It was then installed in City Hall Park in Manhattan. Civic Virtue in Manhattan's City Hall Park, circa 1940. Soon it was exiled to Queens, where, exposed to the elements, it deteriorated. Learning of its sad state, Richard Moylan, Green-Wood’s president, offered it a new home, and a promise to restore it. New York City accepted that offer. You can find more on Civic Virtue in an earlier blog post. And here is David Dunlap’s piece that appeared last month in The New York Times. 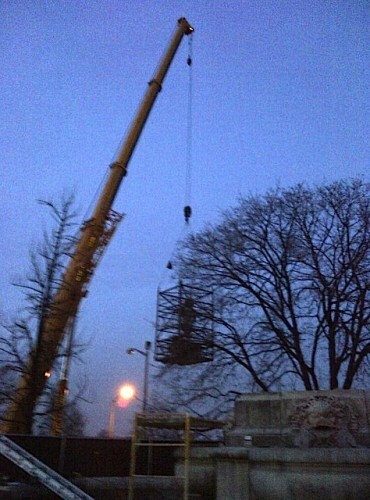 So, this past Saturday, a crew was out early, in front of Queens Borough Hall, to hoist Civic Virtue up with a crane and to load it onto a truck. Civic Virtue as it was raised from its Queens location on Saturday morning. By late Saturday, Civil Virtue had made its slow ride to Green-Wood. Civic Virtue, resting face down along Green-Wood's entrance road, after its trip from Queens. And, yesterday morning, December 17, 2012, the sculpture was installed on its custom-made foundation. 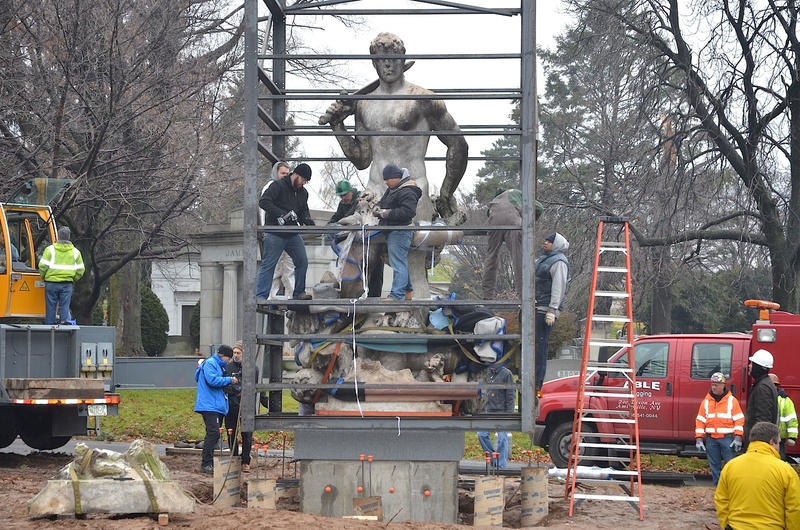 Civic Virtue, surrounded by the metal armature that was used to move it, after being lowered onto its new base at Green-Wood. Civic Virtue, with the crane that lifted it into place at Green-Wood. Civic Virtue, in place, at Green-Wood. In the spring, with warmer temperatures, conservation of the sculpture and completion of the development of the site, including landscaping, will occur. Green-Wood Cemetery has been a sculpture garden since soon after its creation in 1838. It has now added another sculpture to its collection. Welcome, Civic Virtue! "Civic Virtue", Frederick MacMonnies, Richard Moylan. I am so happy that Civic Virtue’s new home is Greenwood Cemtery. There, in its new home, it will be truly appreciated and delighted in by all those who visit and delight in the beauty of Greenwood. I have long been intrigued by the varied history of CIVIC VIRTUE. Created by a renowned artist — MacMonnies’s other works included the sculpture groups on the Arch in Brooklyn’s Grand Army Plaza — and installed with great ceremony, it was originally considered a jewel of the enlarged City Hall Park. (What is now the southern tip of the park was long occupied by a large post office.) Another famed artist, Childe Hassam, painted a 4th of July Ceremony in the park, with the statue featured prominently. This painting hung for many years in the main banquet hall at Gracie Mansion. The last time I visited the Mansion, however, the painting had disappeared. The statue began to get bad press when women and women’s issues became more prominent in the city’s social and political life. In the statue, Virtue is a young and vigorous man, who is trampling Vice, represented by sensuous women (and, of course, a couple of snakes). In the face of growing protests against what was seen as blatant misogyny, the statue was moved to Queens, mostly because there was a place to put it, and where it was utterly neglected. Since 1986, the Queens Borough President has been a woman, and both Claire Schulman and Helen Marshall have expressed annoyance with what they see as an offensive statue right in front of their office. I’m sure Ms. Marshall welcomed Green-Wood’s intervention. A final irony: the week before the move, a small band of Queens politicos raised a protest about the “loss” of this “beloved” Queens landmark. Guys, where have you been for the last 60 years? 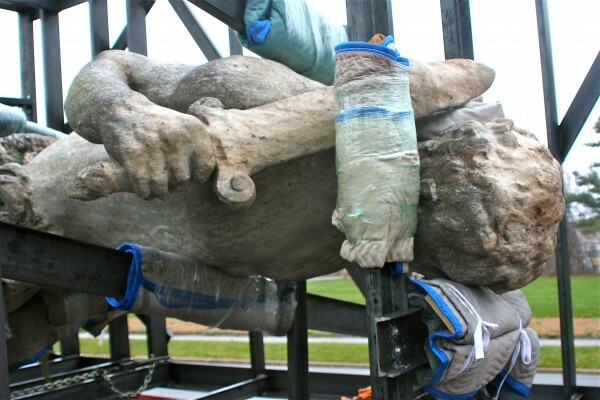 I look forward to the statue’s new life, and, no doubt, more controversy at Green-Wood. Thanks. That’s very interesting–particularly the information about the Childe Hassam painting. Will see what we can find on that. I’m sorry but this statue is extremely ugly. There is a reason why it was banished to Queens. Green-wood has too many beautiful things for this. We will agree to disagree . . .
Will the fountain at the base of the statue also be coming to Green-Wood? No, the fountain is staying in Queens. anyone know who the model was, and what his relationship, if any,to the sculptor , or the patron, was? Is there some other back story to the statue worth uncovering after all these years?? Funny you should ask about the model. It looks like it was none other than Charles Atlas! Atlas, of course, had a world famous physique–though he was only about 5′ 10″ and weighed all of 180 lbs., he had a 47-inch chest and a 32-inch waist. In 1922, Atlas won the title of “The World’s Most Perfectly Developed Man.” He went into business selling training programs to thousands. According to an account in The New York Times on June 11, 2000, “There is anecdotal evidence that the sequoian arms and legs of Mr. Atlas were used by Frederick MacMonnies for the male figure in “Civic Virtue. '” It appears that Atlas also posed for Alexander Calder’s sculpture of George Washington that now stands on the west pier of the Washington Arch on the north side of Washington Square Park, as well as several other sculptures. According to Flight with Fame: The Life and Art of Frederick MacMonnies, by Mary Smart 91996), the model was a New York City fireman named George Lorz (p.256). Reminds me of Michelangelo’s David. Will be making a trip there to see it in person. David or Apollo, with the same configurations of the subject’s legs. Until March 3 its on view at the National Gallery in DC. Maybe this was a reference for Civic Virtue too? No, I have not seen anything about those models. Can someone post where in Green-Wood the statue is located? It is on the island at the intersection of Jasmine and Garland Avenues in section C.
Was visiting a family grave on Friday, May 17 and came across this statue (one of the moving straps was still in place). This is one ugly work of art but I suppose historically interesting even though it really is horribly sexist. But why the heck is it in Green-Wood Cemetery? 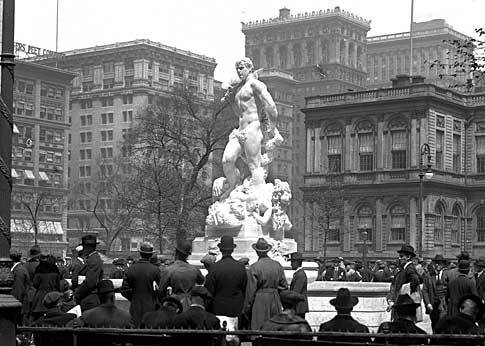 “Civic Virtue” is by one of America’s great early 20th century sculptors–Frederick MacMonnies. It is at Green-Wood because it had, essentially, been abandoned by NYC. It was in need of repair and a good home. Repairs began this past week. Green-Wood has been a sculpture garden since soon after its founding, 175 years ago. It continues to be a sculpture garden–for works from the 19th, 20th, and now 21st century. Sexist? It’s an allegory. The figures may be female, but they’re not women. They’re Naiads, mythological creatures akin to Odysseus’ sirens. The controversy shows the gap between 19th century artistic ideas and modern ones. (Yes it was comleted in 1922, but it was commissioned in 1909 and the sculptoir was born in 1863.) You’re being too literal. ” louche”! A word we don’t hear enough of these days. I correct myself! In Kessner’s biography he quotes Fiorello as describing the statue as,”Loutish”!